LogicManager is comprised of ERM and GRC thought leaders who are eager to share their insights and best practices for integrated governance, risk management, and compliance programs. Whether one of our executives is delivering a keynote address at a national conference, or one of our advisory analysts is hosting a tactical enterprise risk management training session, we’re deeply committed to sharing our expertise and expanding the practice of ERM. Expectations from all angles of an organization call for more business value and actionable results from risk management. Managers must make operational decisions that are far from their organizations’ risk appetite policies. By utilizing an effective enterprise risk management program, you are able to collect and share risk intelligence, uncover root causes, and re-aggregate information through the various levels and lenses of your risk universe. LogicManager’s risk management speakers have presented at a number of venues; including large conferences, regional seminars, industry working groups, ERM training sessions for boards of directors and executive teams, webinars hosted by industry associations, and more. Previous session topics include Presenting Risk Management to the Board, Operationalizing Risk Management & Cybersecurity, Best Practices for Risk Assessments, and Making ERM Actionable. We also provide tactical training for organizations utilizing the RIMS Risk Maturity Model, a best practice framework and online assessment tool for benchmarking ERM maturity. LogicManager CEO Steven Minsky is our most sought after speaker. He is a recognized thought leader in the risk management industry, as well as the author of the RIMS Risk Maturity Model. Click below to see a video of him speaking about his original concept, the See-Through Economy. Want LogicManager at your next event? If your organization is hosting an upcoming event, LogicManager’s risk management speakers are a great resource for adding risk-based expertise to your lineup! Visit our Events page to see a full list of our upcoming and past engagements, or submit a speaker request above. LogicManager is experienced in working across industries to deliver the best risk management training and information. 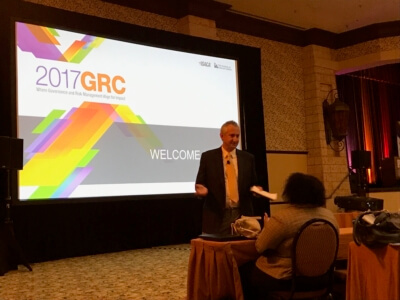 We look forward to helping you advance the practice of risk-based GRC! Steven is a recognized expert and thought leader in enterprise risk management (ERM). He is both the CEO of LogicManager and the author of the popular Risk Maturity Model (RMM) framework an online assessment tool. The RMM has been proven to increase an organization’s market value by 25%, according to an independent study published in the Journal of Risk and Insurance. Steven is also a patent author of risk and process management technology who enjoys presenting with other risk management speakers and enthusiasts. His past enterprise risk management training sessions have been highly effective and he looks forward to more opportunities to share his thought leadership in the future. Watch Steven speak about his original concept of the See-Through Economy here. You can follow him on Twitter at @SteveMinsky.